I'm studying finance and trying to write a sermon at the same time. It's a little confusing. I apologize for the poorly scrawled posting last night. I was still at work, I was tired, it was late. Clearly, not a lot of editing goes into these things. Yes, I was at work late last night...just because Richard is attending a workshop on my campus and I waited for him before going home. We had dinner together, and then he went to his workshop and I spent some time studying for my finance class. This morning, my commute was cut back down to a more normal size. For the last year, I've been trying to find alternative routes to get to work. 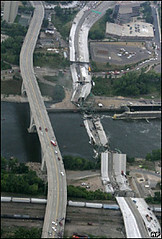 The I-35W bridge was my main route, and once it collapsed, it left me with difficulty finding a way to get to work. For one thing, it was the only direct route. Everything else was clearly out of the way. Secondly, I battled traffic for a long time, getting into work and going home. But this morning, the I-35W bridge has reopened, and my trip to work was smooth as silk. Once again, I'm at work very early, ready to face the day. I'm happy that the bridge is back. It was sure missed. The news says that there are so many sensors in the bridge that it's the most monitored bridge in the country. I hope that means that it will be a safe bridge for many years t come. In memory of those who lost their lives on August 1, 2007. I'm wearing a suit today. Yes, I sometimes decide that I need to dress the part of a professional, and I go the whole distance. Often, this is when I have a function that is in front of other people. Today was such a day, so I wore a suit. I've noticed that I work in an environment where a suit is not necessary, unless one is a member of the senior administration. When I do wear a suit, there are comments of surprise. I'm not sure if the surprise is because of me or because of my environment. Anyway, I dressed up today. I look nice. I spent the weekend traveling to a friend's wedding. It was in Tofte, MN, which is way up on the North Shore of Lake Superior. That made for quite a drive (about 4 hours). I couldn't leave work until 2:30, so I didn't get there until sunset. Richard rode up with friends who were leaving earlier. It had been years since I was on the North Shore, so it was fun to relive my memories of this area. I drove by Gooseberry Falls, and Split Rock Light House...blast from the past. We stayed at Bluefin Bay Resort, and the wedding and all the celebrations were there. We had decided to go into an "apartment"-style place with friends. We had three bedrooms, a jacuzzi, and a super view of the lake. Richard got some good photos...maybe he'll post them on his blog. It was a lovely weekend. It was like a vacation with a wedding attached. Early September is a flurry of activity. My days are very long, and filled with such a variety of projects, that I can't easily say what I did on a given day. Lately, I've been describing my activity as "lurching" from one thing to another. I don't like lurching. It means that I'm not giving time and attention to any one project. I would rather be able to spend time to finish something and feel good about it, not just "get it done". This is the transition from summer to fall that always gets me. Eventually, I'll find my groove, but for now, there is some turbulence ahead. I'm posting, mainly just to let you know that I haven't forgotten about this blog. Life has gotten full, with the State Fair, the Republican National Convention (and all the riots and scathing speeches it brought our way), and the start of school has really crept up on me. I could right about how happy I am that we now have the Twin Cities back. The barricades are coming down. Life is returning to normal. But I won't do that. I'll just say that I'm in a routine again, and my routine involves 14-hour days of lurching from one activity to another.